Two and a Half Canadians in Cambridge: Bike Gang, Bike Gang, Whatcha Gonna Do? Bike Gang, Bike Gang, Whatcha Gonna Do? Sometimes you have to rock out. Chris obviously loved that we rocked out while he was driving on the wrong side of the road, sitting on the wrong side of the car, and shifting with the wrong hand. It was super safe. We spent the weekend in Bognor Regis, visiting our Grandma. The definite highlight was when Chris & my uncle Derek dismantled a seagull nest on the roof of my Grandma's house. Apparently, having a seagull nest with eggs on your roof is bad for your roof (or something), so they took it upon themselves to get rid of it. This 'dismantling' process was made much more difficult by the lady seagull caw-ing and squawking for her seagull friends to save her eggs - no jokes, all of a sudden there were at least a dozen seagulls circling the roof, and squawking their lungs out at Chris and Derek. It was, from the ground, pretty hysterical. I came up with the brilliant idea for Chris to bang together two brooms to frighten away the birds, while Derek broke up the nest. Not gonna lie, Kathryn & I both had sad, sad moments when we saw the lady and man seagull standing where their nest used to be, randomly squawking while they looked for their eggs. It was sad. We may or may not have been hormonal. 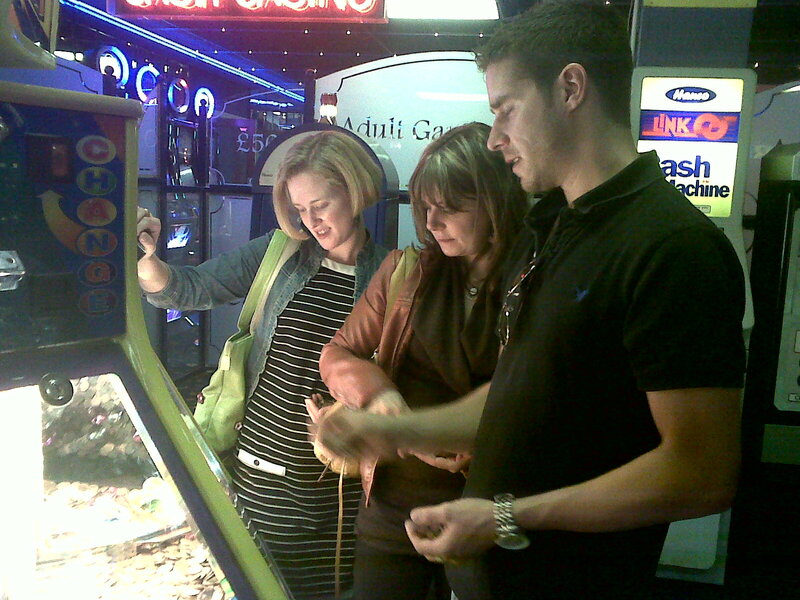 The best entertainment in Bognor Regis: penny arcades. We had a system to win - it was like that movie about the MIT students in Vegas. Only those students won money, and we didn't. Also, we were at an arcade on a scuzzy pier in a small British seaside town, and they were in a casino in Vegas. Okay, so it wasn't exactly like that movie. 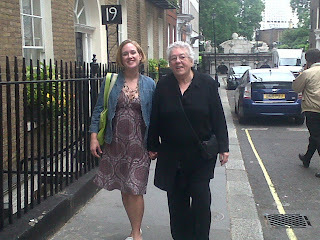 From good ole Bog, we headed to London, to visit the Queen, my Nanny. It was wonderful to see her again. 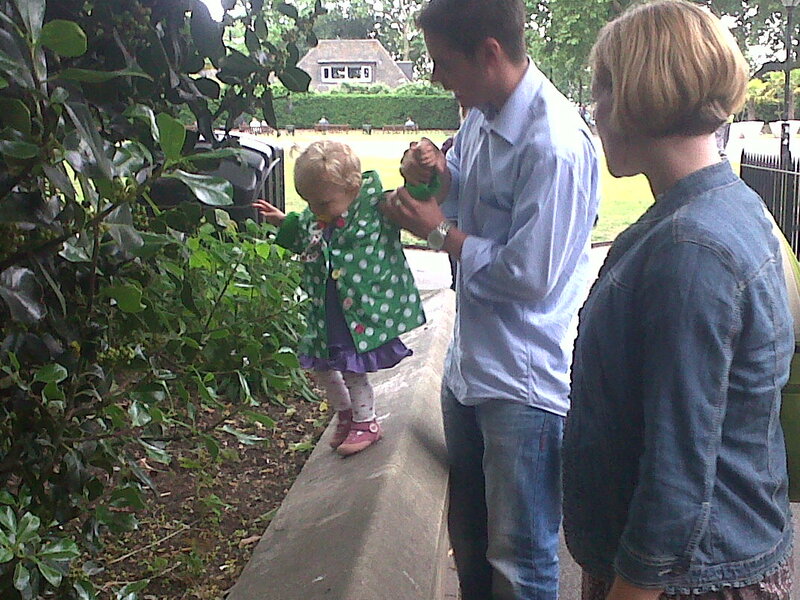 Matthew brought Elizabeth down on the Sunday, and we went into town the next day with Ross & Dina. It was one of those 'go to London but don't actually do anything' kind of days. We did eat twice, and go for a drink, but other than that, I can't remember a single thing. 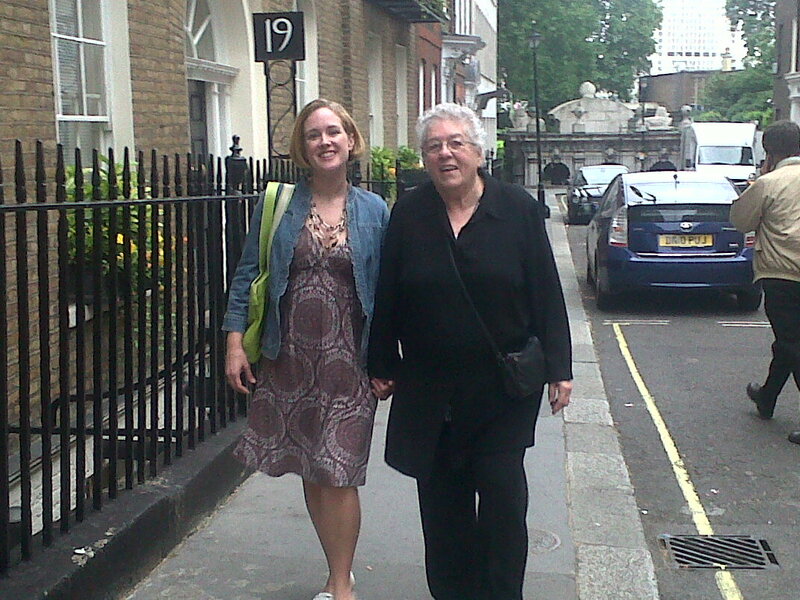 Nanny came up to meet us for dinner, and then E & I went back home to bed while the rest of them went to the theater. 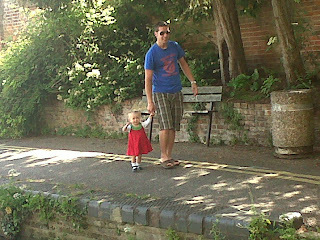 We had just come up from the Embankment, where Nanny was telling us how she and our Grandad used to go walking together there. She got all blushy and smiley. Cutie, cute, cute, cute. After London, they all came back to Cambridge. I was so excited for them to see my new place, and my new city. It's a pretty impressive place to visit; we sometimes forget that, and every so often it's good to be reminded of how beautiful our city is. 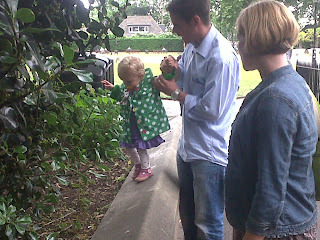 On the way to Cambridge, we stopped in Marlow to visit our cousin Lucy, and to meet her beautiful new baby, Olivia. Elizabeth loved Olivia. She kept trying to poke her in the eyes - I think it was true love. Also, Olivia's house has a doggie, so obviously Elizabeth was in heaven. 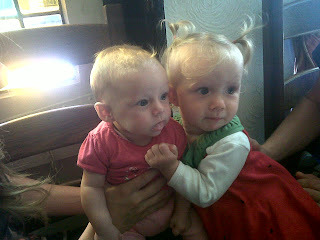 Babies hugging babies - it's like kryptonite for the biological clock. 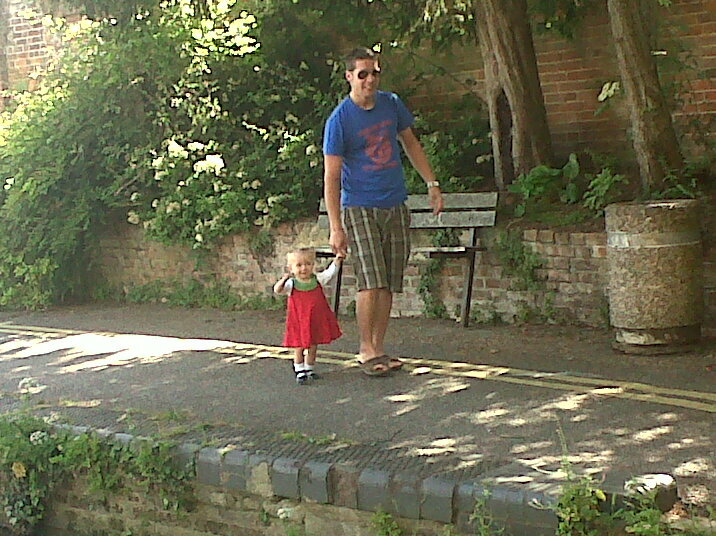 Seriously, how cute are my brother and my baby? Holding hands and walking along together? Too much! The best way to see Cambridge is from a bike, and when all 4 of us were on our bikes I was totally reminded of my clever Mum's summer activity for us: Bike Adventures. We'd pack a lunch, and bike somewhere 'exciting', and spend the day out of the house. Clever, clever Mum. Anyways, about 18 seconds after we left the bike rental place in Cambridge, Chris popped wheelies, Suzie put both her legs out and coasted, and Kathryn told us to watch out for cars. We pretty much reverted to our childhood selves, and it was awesome. 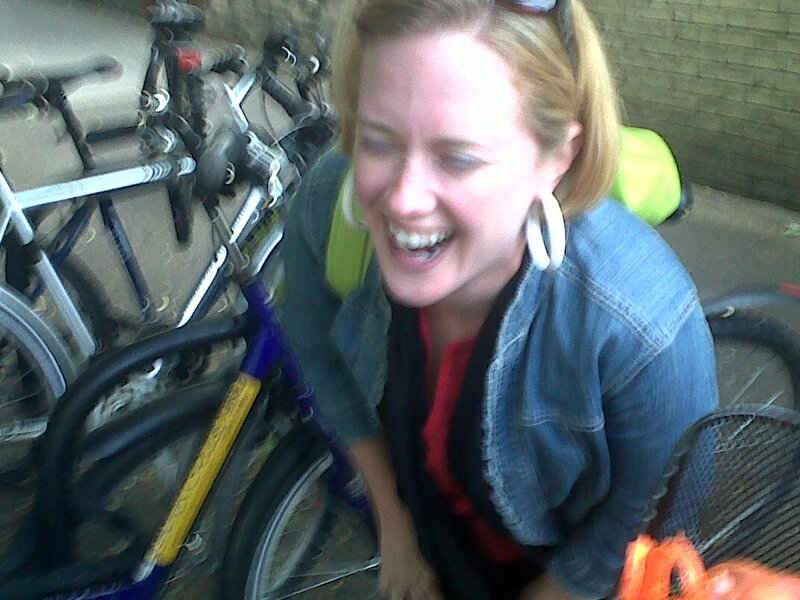 when she realized she had left the key in the lock of her bike lock. 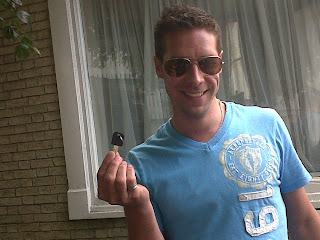 Chris was a helper, and found it for her just as she started freaking out that she'd lost the key. Yay for Bike Gangs!! Ahh the bliss of all those summer afternoons all alone. I WAS a great mum!